When driving to MFASC, look for the blue "H" signs. Located adjacent to Community Memorial Hospital. 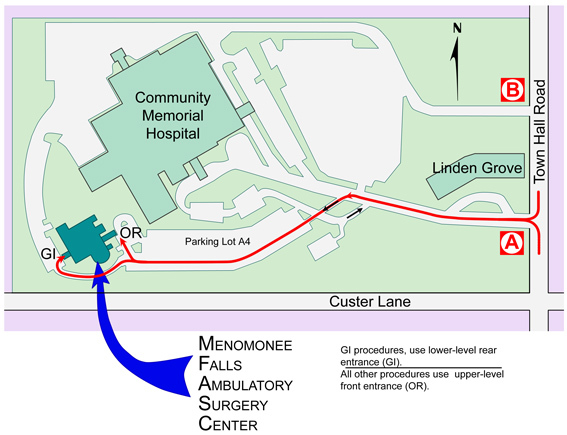 Use Hospital driveway "A" off of Town Hall Rd, then follow the signs for Menomonee Falls Ambulatory Surgery Center to the left. Our new Gastroentrology (GI) center entrance is located around the left side of the building in the back. Hwy F (Old 164) north, to straight ahead on Hwy 74 into Sussex. Follow Hwy 74 to the right at Main Street in Sussex, then left on Hwy 74 at Town Line Rd. 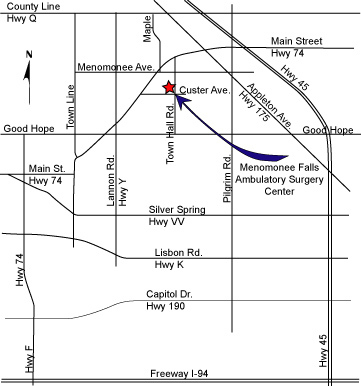 Hwy 74 through Lannon to right on Custer, to left on Town Hall Rd, to driveway. North on US Hwy 45, exit west on Good Hope, to right on Town Hall Rd, to driveway. South on Hwy 45, exit west on Main Street/Hwy 74. Through Menomonee Falls to left on Town Hall Rd, to driveway. East on County Line Rd/Hwy Q, to right on Maple Rd., to left on Menomonee Ave., to Right on Town Hall Rd, to driveway.